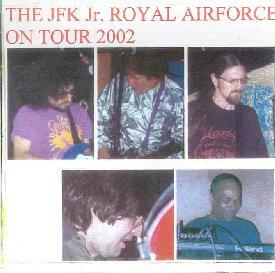 The JFK Jr. Royal Airforce - "On Tour 2002"
The promo sheet that came with this CD states very clearly that it's For JFK Jr. Fans Only!! The reason for this is the bootleg sound quality throughout the album. But don't run away!! On Tour 2002 is a collection of crudely recorded live performances, practices and radio interviews from JFK Jr's first ever tour. The sound you hear was the best they got, and they correctly point out that fans of the Velvet Underground and the like are shelling out bucks for similarly poorly recorded live recordings. But for those of us who have had the good fortune to experience JFK Jr. live, as well as being enamored of the deliciously raw sounds that characterize nearly everything the Slutfish label releases, this is a scrumptious document of what these spacenauts can achieve in live performance. Most of the CD is from the live performances, and despite the sound we get a good feel for what a killer jamming space rock band JFK Jr. are, as well as being treated to fiery versions of songs from the CD's. "Dark And Stormy Night" is a thrashing space jam that comes off as a cross between Devo and Hawkwind's Space Ritual á la "Born to Go". Excellent punk laden rock and freaked out alien electronics. "Sonic Youth" is a similar pounding Space Ritual styled space rocker (from the first JFK Jr. CD) with lots of old time jamming Krautrock sounds and plenty of molten acid psychedelia. One of those Guru Guru styled jammers that made the first JFK album such a monster and STILL one of my favorite space rock albums of the last several years. I love the space cosmic exploratory version of "Take The Chicken From The Man And Give It To The People" a song from their second CD. Ditto for "6231 Garbarge Man" from the second album. At the end of Take The Chicken they segue directly into "Invisible World", but it cuts out after a couple seconds and we get a rousing verion of "We're Going Down", also from the first JFK Jr. album. "Place In The Field Where The Cows Like To Die" is a cool acid rock tune with shades of Hendrix, mind numbing drones and an avant-garde jazzy edge. If I was disappoined about "Invisible World" getting cut off earlier I needn't have been. The band later launch into a blazing mindfucked space punk version with bashing guitars and swirling synths. My head was spinning listening to this sucker!! But this is only part of an 11+ minute segment from a Brooklyn performance that includes lots of jamming space freakiness and a mucho stellar Alien Planetscapes synth vibe that Louis Boone brings to the band. If you like free-wheeling space jams then step right this way because these guys get seriously spaced and intense on this one. Wow! We're also treated to a 14 minute practice session piece called "Blaze", which consists of pulsating exploratory space rock that blends ambient and jamming rock elements. There's an experimental edge to the jam that again references the old Krautrock bands, and of course oodles of psychedelic influences, though the general atmosphere is completely spaced. Tasty! !